Did you know that over the past year alone, plant-based food categories have grown more than 20 percent, compared to just two percent for all other food categories? Or that 40 percent of Americans are actively seeking to cut down on meat consumption? Transcending food trends, more consumers are seeking out sustainable and ethical food options. The entire foodservice industry–and restaurants in particular–can respond to this desire by learning more about this mindset to better serve guests. To that end, the Eat for the Future Business Forum at the upcoming Plant Based World Conference and Expo will feature a variety of sessions designed to help restaurant owners and operators do just that. Early bird pricing ends Friday, April 5. Click here to register. An all-access pass will go from $595 to $695, while the Business Forum pass will rise to $495 from $395. The conference is being held June 7–8 at Jacob K. Javits Convention Center in New York City. The exhibitor list is fast nearing 100 companies for the event. How to Menu for the Flexitarian Consumer: The number of consumers identifying as flexitarians is rapidly increasing, and food service establishments risk losing out on business if they cannot provide options for this audience. Even with that understanding there comes a whole slew of unique challenges. This diverse panel will discuss the best ways to add plant-based options to the menu with your client-base in mind. Plant-Based Milks: Trends, Innovations and What's Next for the Hottest Segment in the Space: The dairy alternative space has exploded in the past few years with plant-based milks now representing 15 percent of the total milk market. This panel will focus on what's next in the plant-based milk space, and how established and new brands can take advantage of this growing segment, innovating with alternative non-dairy bases, unique flavors, applications, enhanced nutrition profiles, and beyond. Would You like to Try the Plant-based Option? Trends and Opportunities in Food Service : Whether it's a 100 percent vegan burger joint, an upscale restaurant adding plant-based menu options, or a classic fast food chain that's decided to add a vegan product to their menu, plant-based foods are becoming more prominent in the world of restaurants and food service. Around 40 percent of Americans order plant-based options in restaurants and eateries that introduce vegan or plant-based items on their menus often see a great increase in sales. This panel will focus on brands and companies that are captivating this new trend and working to provide a more diverse set of options for a wide audience. Culinary Workshop: The Philosophical Shift Towards a Plant-Based Kitchen: Understanding plant-based cooking requires a fundamental overhaul of everything you've ever known as a chef or restaurant professional. Brad Barnes of The Culinary Institute of America specialized in helping culinary and food service professionals grasp this concept in a way that allows their careers and businesses to thrive like never before. 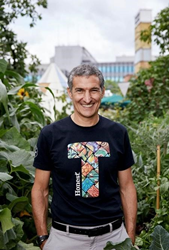 Case Studies in Retail (Tesco) and Restaurants (Bareburger): Chef-Driven Plant-Based Prepared Foods Developed for a Grocery Chain (Tesco) Tesco recently brought on plant-based chef Derek Sarno to help develop a line of plant-based prepared foods to be sold in stores across the UK. This discussion will focus on the process of developing items for the line and will track the success and growth of Wicked Kitchen as an example of how other major retailers can capitalize on plant-based trends to diversify their clientele and expand offerings. Plant-Based Menu Items at a Fast Casual Burger Joint (Bareburger) The fast-casual burger joint is a staple of American culture. New York based chain, Bareburger, is leading the way in maintaining the atmosphere and flavor that is typical of a burger restaurant while also integrating a diverse range of plant-based options. This case study will dive into the success that Bareburger has had generating over 25% of it's business from the plant-based side of the menu. The Future of Seafood: Opportunities in Plant-Based and Cellular Aquaculture: Within the alternative protein space, seafood is the most underserved category. This panel will discuss innovation in the plant-based food space to create superior seafood products that can be used in a variety of applications from sushi to sandwiches as well as get into the promising new world of cellular-aquaculture. Seth Goldman, Co-Founder & TeaEO Emeritus of Honest Tea and Executive Chair of Beyond Meat will present Turning a Mission Driven Business into a Mainstream Revolution during his keynote talk to kick off all Saturday programming. The keynote will be recorded during the live event and aired at a later date on the Eat For The Planet podcast hosted by Nil Zacharias, partners of the Eat for the Future Business Forum, taking place on Friday, June 7 and Saturday, June 8 during PBW. The Plant Based World Conference & Expo will feature leading plant-based food industry companies like Founding Partner, Follow Your Heart; Gold Sponsors 22 Days Nutrition, No Evil Foods, and Good Catch Foods; and Silver Sponsors Daiya, Tofurky and Miyoko's Kitchen. Other Sponsors include Dr. Praeger's, Ingredion and Upton's Naturals. Modern Restaurant Management (MRM) magazine is a media sponsor for Plant Based World. Early bird pricing ends Friday, April 5. Click here to register.